Curated by Nicolas Bourriaud and XYZ (Xenia Kalpaktsoglou, Poka-Yio and Augustine Zenakos, the curatorial trio which founded the Athens Biennale), MONODROME revolves around an unlikely encounter: The Little Prince meets Walter Benjamin. This intentionally peculiar coupling of the two figures acts as the ground onto which the ongoing worldwide sociopolitical and financial upheaval will be examined, through a narrative that will address humanity in a universal and poetic manner. 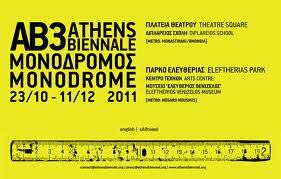 The curators of the 3rd Athens Biennale 2011 believe that the widening situation for which Greece is a much derided yet overexposed case-study must become the focus of cultural investigation, in a way that it is no longer poignant – or even moral – to simply keep making exhibitions in the way that had become the norm in previous years. So, they decided to address these issues into the exhibition’s conceptual framework and into the biennale exhibition format itself, by following a double process: Firstly, to transform the biennale into a sit-in and a gathering of collectives, political organizations and citizens involved in the transformation of society, an invitation to create a political moment rather than stage a political spectacle. Secondly, as the exhibition is designed and produced, its various stages of development are providing the basis for a feature film directed by Nicolas Bourriaud. The film will be a work of fiction al beit based on real events. This is the first time that the relationship between contemporary art and filmic language is investigated so thoroughly and so creatively.